The SpectrumForce Base Scanner Mounts are built with strong sheet-metal, allows you to attractively mount and display three or four base or base/mobile scanners that are approximately 7 to 7.5" wide. 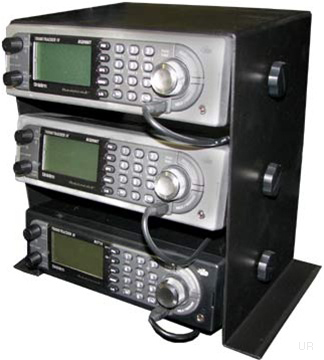 You can mount any combination of the following Uniden Bearcat Scanners: 760, 780, 785, 796, BCT15, BCD996T; GRE PSR400 and PSR600; and a variety of Radio Shack models including the 2053 and 2096 and similar models. 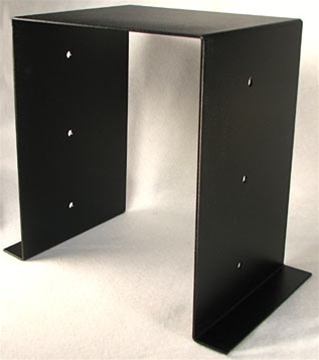 You can also drill holes in the bottom flanges to secure the mounting bracket to a desk or table but the radio weight keeps the unit from sliding in general. You can tilt the radios slightly upward for easy of operation if you desire. The front of the radios protrude approximately 1/2" from the edge of the metal providing a very strong and again, professional, appearance. Simply use the mobile mounting knobs (or bolts can easily be found at a local hardware store) to secure the scanners in place. These brackets are being used at news media assignment desks nationally as well as by hobbyists as a clean and attractive way to present and operate the radios. The brackets have been black-powder-coated to add to the professional look. 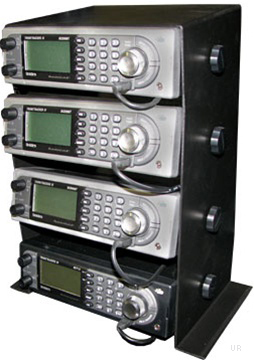 The mount fits radios of 7.5" perfectly such as the DIN-E radios: The BCT15, BCD996T, PRO-2096, PSR400 and PSR600. But earlier scanners that are 7" wide will require the addition of a few washers or a nut. Copyright 2012-2019, Universal Radio, Inc.